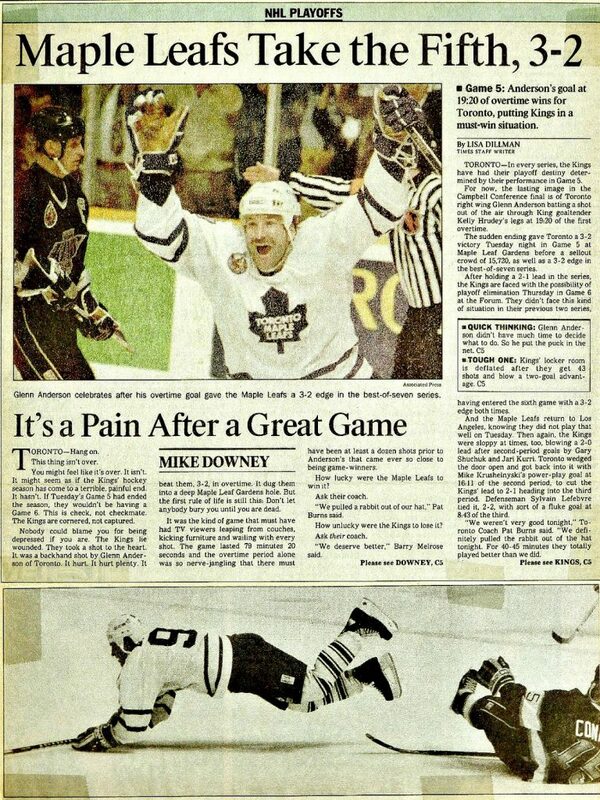 TORONTO (May 27) — It was 25 years ago tonight. Really. 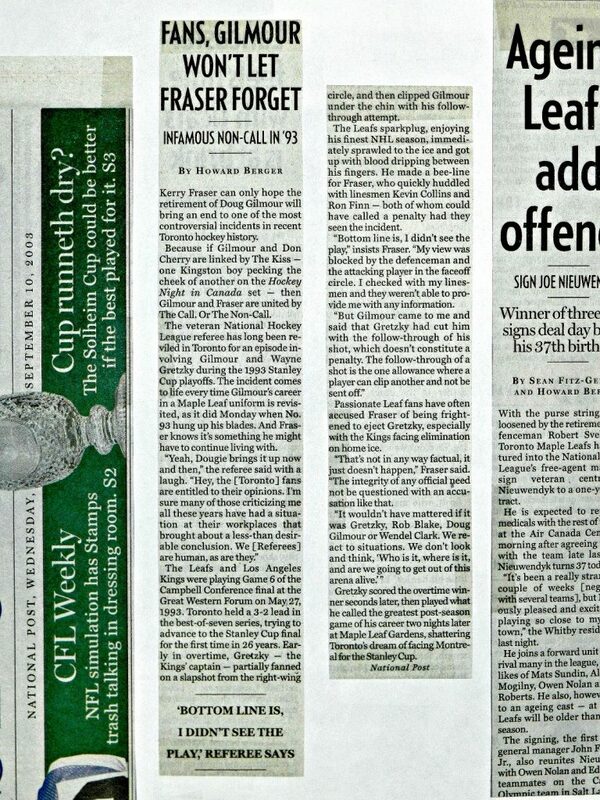 Forlornly, and hardly dulled by the passage of time, Maple Leaf zealots remember Game 6 as The Night Kerry Fraser Froze. But, it was much more than that. Above all, the Leafs have not been so close to playing for the Stanley Cup since 1967. It remains the lone example of the post–’67 era in which the club was one goal away from The Dance. As such, it still represents the funeral of hope for millions of hockey fans around here. Had the Maple Leafs scored in overtime, a Cup final clash with the Canadiens would have followed. Beginning three nights later at the Montreal Forum. 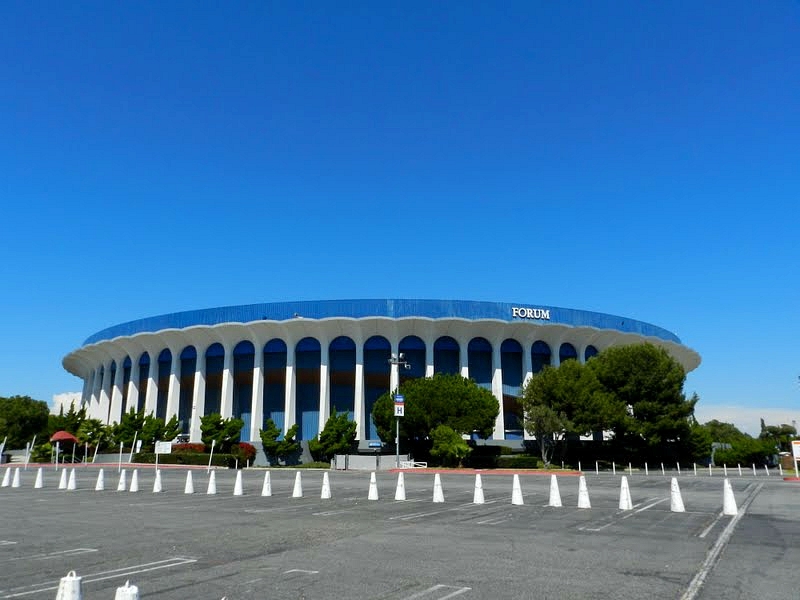 Instead, the Los Angeles Kings moved on to face Patrick Roy and Co. Not 25 years ago tonight in California. 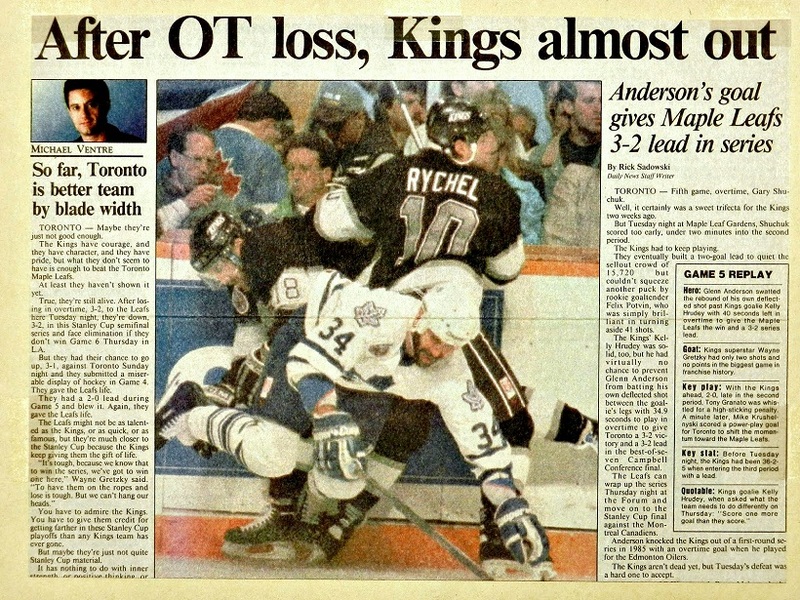 That victory, authored, contentiously, on the powerplay by Wayne Gretzky, kept the Kings alive. 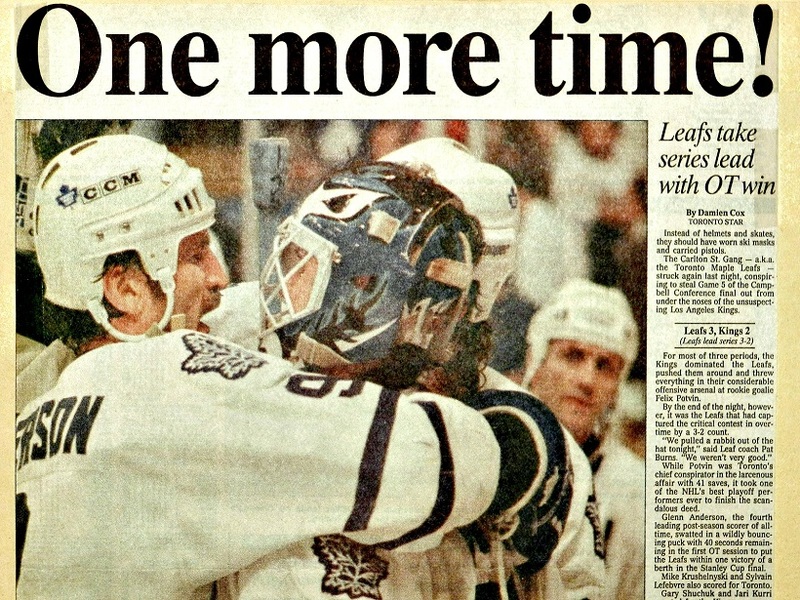 It was two nights later, in Maple Leaf Gardens, that Gretzky consumed the heart of the Blue and White — and its expectant followers — with a 5–4 triumph in Game 7. The unforgettable playoff run — 21 games in 42 nights between Apr. 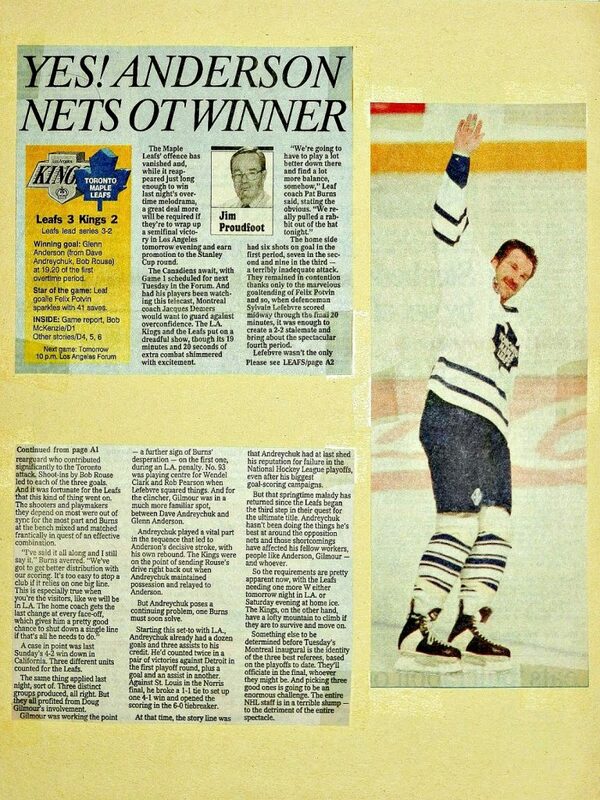 19 and May 29 — followed a remarkable renaissance by the Blue and White under general manager Cliff Fletcher. It was Toronto’s version of the Las Vegas hockey phenomenon that has carried a first–year expansion team into the 2018 Stanley Cup final. Thoroughly unanticipated, the Leafs of 1992–93 came alive at mid–season and soared to a franchise–record 99 points in the standings; 32 points more than the previous year, the largest increase in club annals. Scuffling on Jan. 2 at 15–16–7 after 38 games, the Leafs improved to 29–13–4 in their remaining matches, which included a scorching 18–3–3 run between Feb. 11 and Apr. 3. The surprise turnaround coincided with Doug Gilmour’s breathtaking performance — the tenacious center–man with a gifted touch demolishing franchise records for assists (95) and points (127) in a season. No Maple Leaf has ever performed as prolifically during the span of 3½ months as did Gilmour between early–January and mid–April 1993. He continued his astounding pace with a team–record 35 points in the 21–game playoff march. 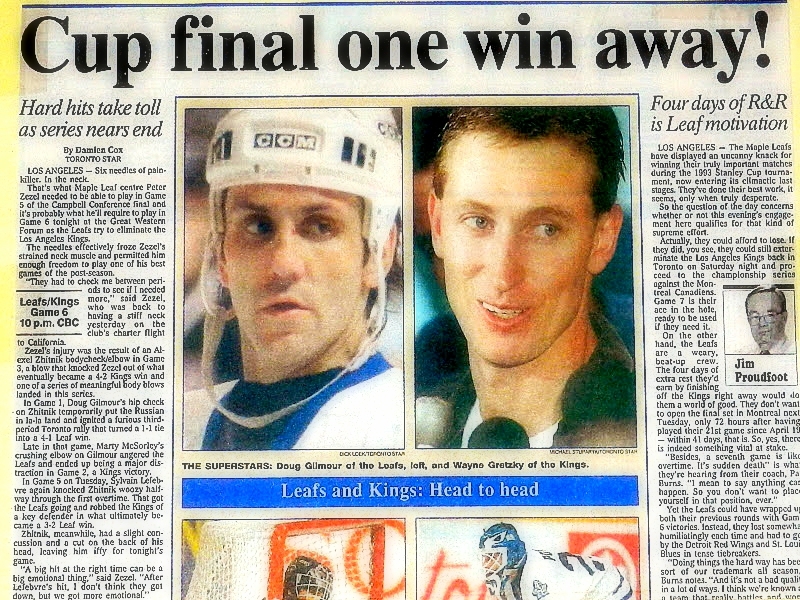 Until, however, the Leafs minimally appear in the Stanley Cup final, their fans will neither forgive nor forget what happened in suburban Inglewood on this date in 1993. The tale is timeworn by now, yet it never fails to ignite passion among Leaf supporters… those that remember watching the game on TV; those that were alive but too young to remember the game, and even such fans as my son, Shane, who hadn’t yet been conceived. I’ve known Kerry Fraser for more than 30 years and can attest that he’s a wonderful fellow. Yet, Kerry, among all–time referees, has long been the sworn enemy of Leafs Nation. His decision to keep Gretzky in the game after No. 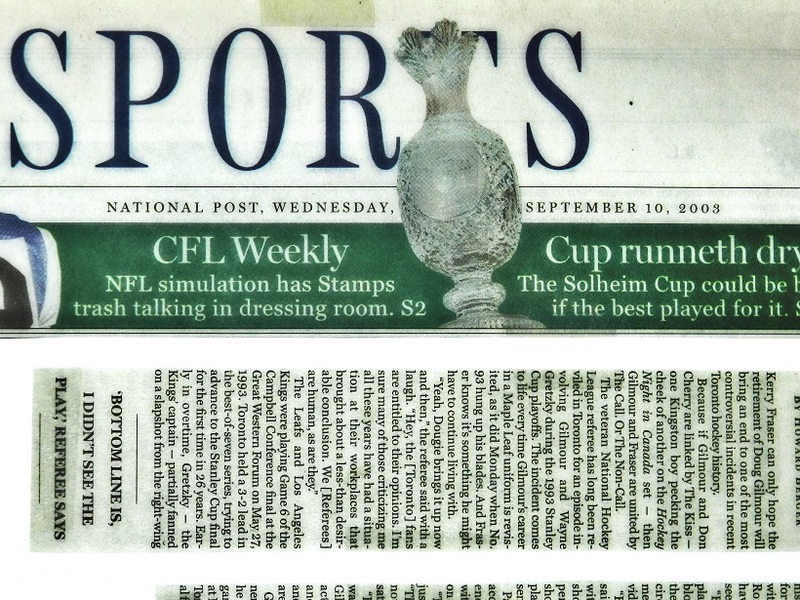 99 had sliced open Gilmour’s chin with the follow–through of a pass continues to haunt the Blue and White — enhanced by Gretzky scoring on Felix Potvin to prolong the series. Frequently overlooked, or forgotten, is a terrible boarding penalty late in regulation by Glenn Anderson of the Leafs, who carelessly ran at Kings defenseman Rob Blake. 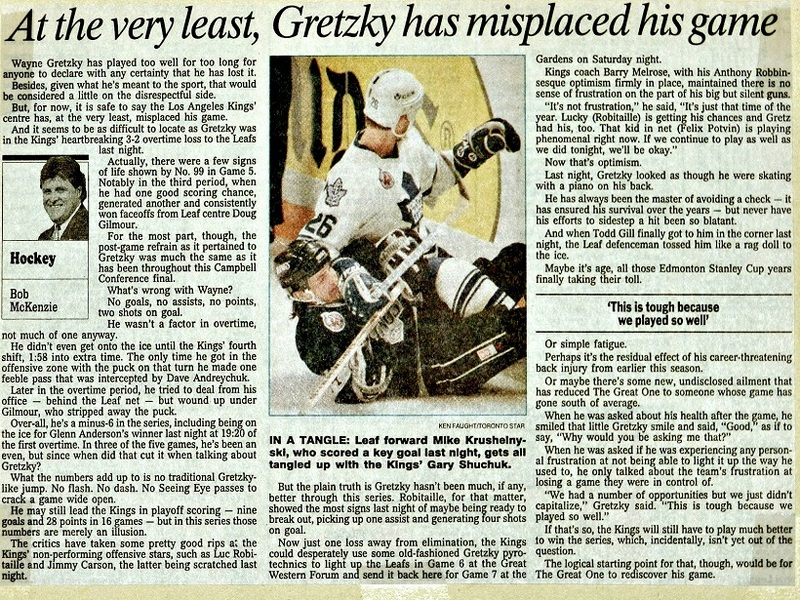 Had Gretzky been banished in overtime, it would have temporarily evened the manpower situation and, of course, prevented him from playing hero. But, it was Anderson’s dumb penalty that carried over from the end of the third period. IF a visiting player had scored in overtime to end the series. MY PHOTOS (ABOVE AND BELOW) OF THE GREAT WESTERN FORUM, AS IT APPEARED IN MAY 1993. 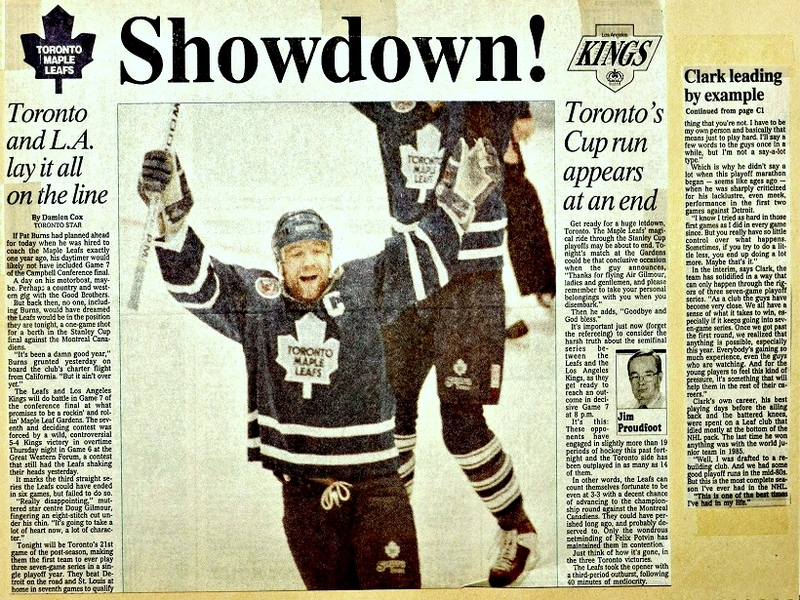 As it were, the Game 7 showdown at Maple Leaf Gardens was nearly anti–climactic. 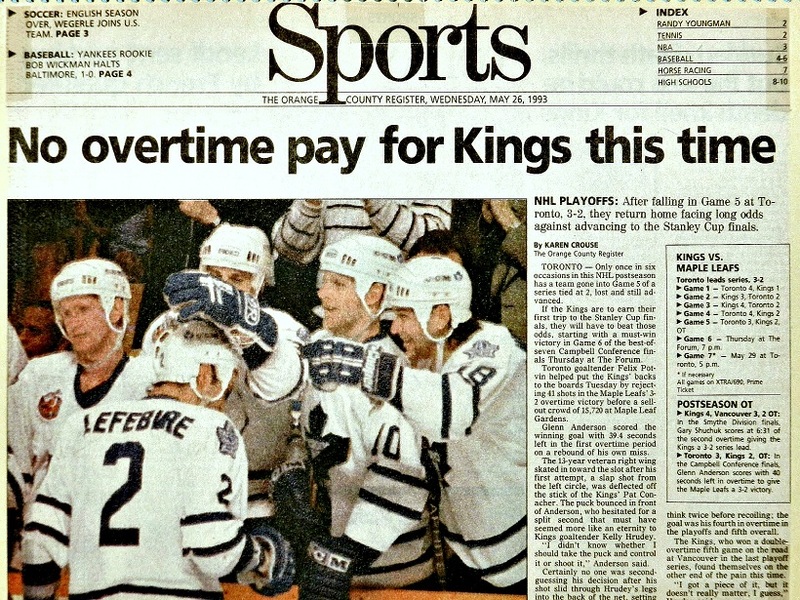 Though the Leafs and Kings were tied, 3–3, late in regulation, you never really had a sense that Gretzky would be denied. One way or another (in fact, several ways), he was going to vanquish the team he grew up cheering for. 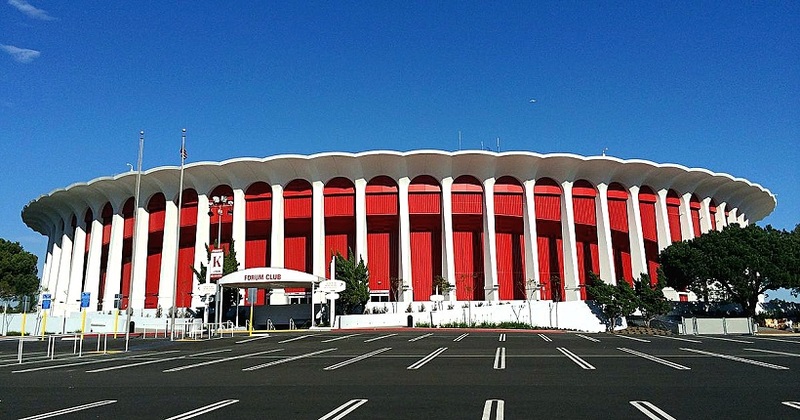 That’s why the match two nights earlier in Los Angeles still has no peer among Leaf games of the post–1967 era. And, why May 27, 1993 ranks with any date in the modern history of Toronto’s NHL franchise. 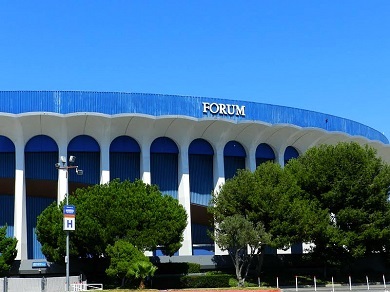 THE LOS ANGELES FORUM — RE–PAINTED ITS ORIGINAL RUST–RED — AS IT LOOKS TODAY. “THEY STILL DISCUSS IT IN TORONTO. A LOT OF PEOPLE THINK GRETZKY GOT AWAY WITH A HIGH STICK ON GILMOUR THAT WASN’T CALLED. KERRY FRASER STILL TAKES HEAT ABOUT IT. BUT, HOCKEY IS THE FASTEST GAME IN THE WORLD. THINGS HAPPEN IN A SPLIT SECOND. FRASER DIDN’T SEE ANYTHING. REFS ARE TAUGHT THAT IF THEY DON’T SEE IT, THEY CAN’T CALL IT. IF THEY SEE A GUY CUT, THEY ARE SUPPOSED TO THINK SOMEONE MUST HAVE CUT HIM, AND IT MUST BE THE OPPOSING TEAM, SO THEY’LL GIVE L.A. A PENALTY? I DON’T THINK SO. FRASER DIDN’T SEE ANYTHING, SO HOW COULD HE CALL IT? I’M ALWAYS AMUSED LISTENING TO LEAFS PEOPLE TALKING ABOUT THE NON–CALL LIKE IT MEANT THE SERIES. TORONTO HAD US 1–0 [IN GAMES OF THE BEST–OF–SEVEN]. THEY HAD US 3–2; LOST GAME 6, THEN GAME 7 WAS IN THEIR BUILDING AND THEY STILL COULDN’T CLOSE THE DEAL. 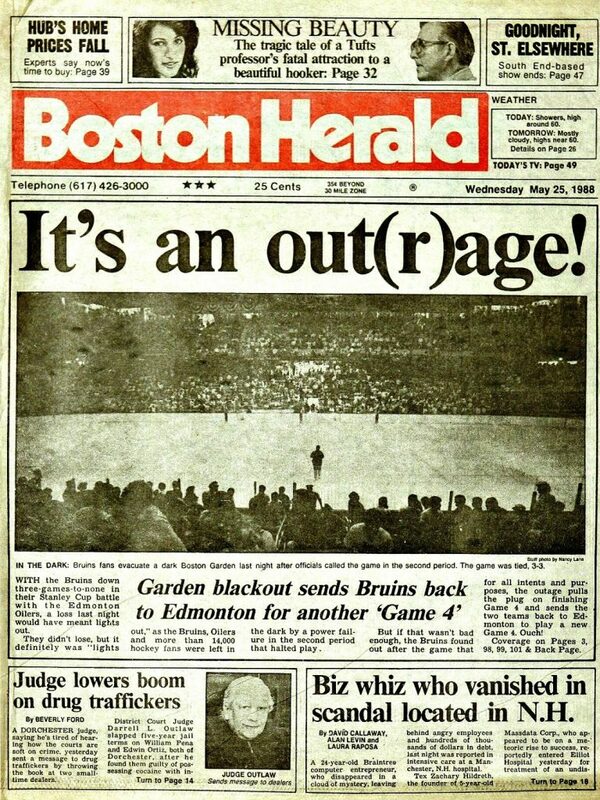 Then there was 30 years ago this week and another enduring playoff memory. 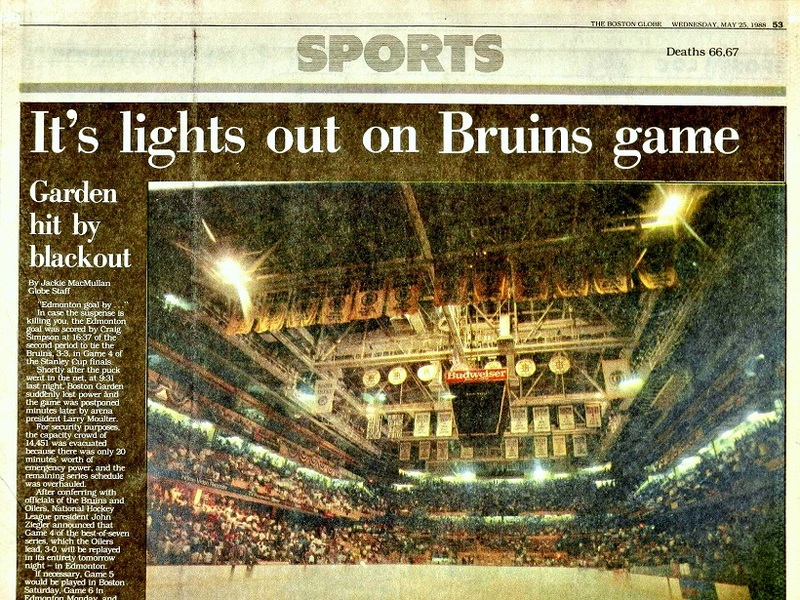 While covering the first Stanley Cup final of my radio career, I was in the old Boston Garden on May 24, 1988 when the lights went out during Game 4 of the championship series between the Bruins and Edmonton Oilers. I remember, to this day, how stifling hot it was in the ancient arena, as I sat in an auxiliary press location behind the north goal. At 16:31 of the second period (9:31 p.m. Eastern time), as the P.A. announcer detailed an Edmonton score by Craig Simpson (now of Hockey Night In Canada), the Garden went dark. And, I mean pitch–black. Seconds later, an emergency generator kicked in, providing enough light to see, but not nearly enough to continue the match. 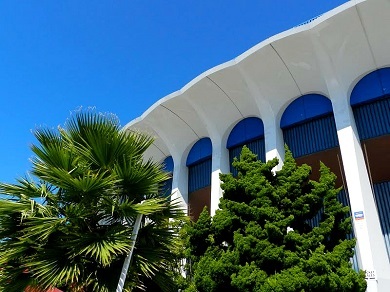 The crowd of 14,451 was ordered to evacuate the building. I’ll never forget carefully negotiating the mostly dark stairwell that led to a street exit. 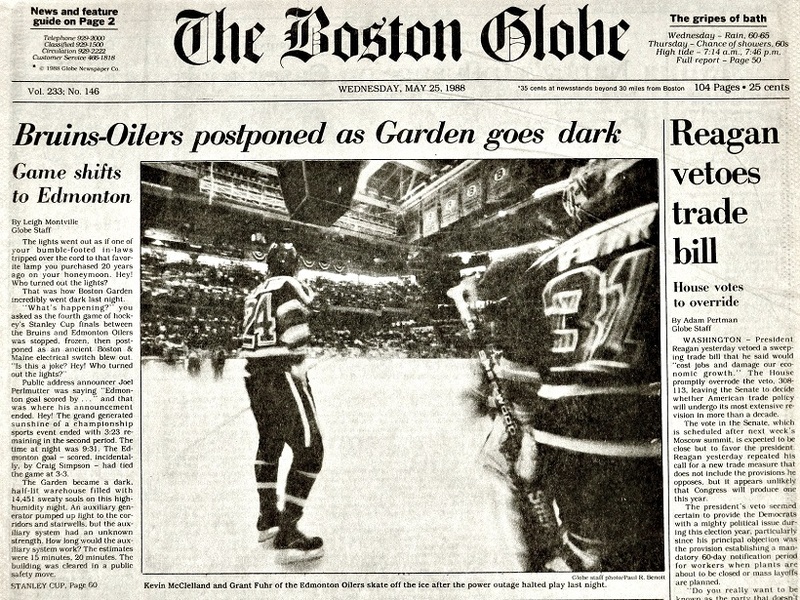 Game 4 was re–scheduled for Edmonton two nights later and the Oilers of the Gretzky era won their fourth and final NHL title. Yes, I’m tired of picking against the once–in–a–lifetime Vegas Golden Knights, which I’ve done in two of three rounds in the 2018 Stanley Cup playoffs. My composite record of 10–4 after 14 series would be all–the–more wonderful had I not chosen Los Angeles to knock off Vegas in the opening round; then Winnipeg to do the same in the West final. So, phooey on logic. How can this upstart group not go the distance? It is the year of Sin City. 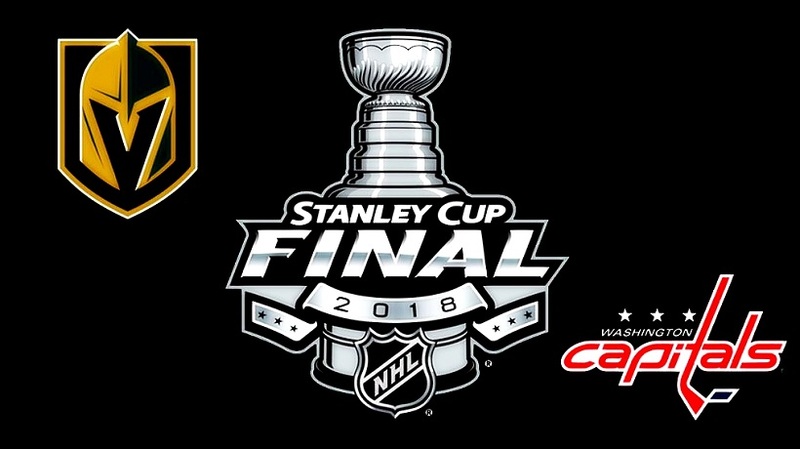 The Golden Knights will defeat the Washington Capitals in five games to hoist the Stanley Cup. Arrgh!!! I remember it like it was last night. I still hate Kerry Fraser. Can’t stand hearing him, can’t stand seeing his picture. I don’t care if he’s a “nice” guy. With ANY other player (perhaps any other referee) they would have called a penalty because of the blood. That incident created that niggling little doubt in people’s minds that there is favoritism in officiating towards a preferred outcome for the league. One day soon (I hope) the leafs will exorcise this demon, but until then I will continue to view the name “Kerry Fraser” as the most vulgar expletive imaginable. I might be overstating it a bit. LOL….BUT NOT MUCH!! Keep the writing coming Howard. Always a fan. Let’s try to keep things in perspective. Kerry recently went through a cancer battle. The Gretzky-Gilmour thing was just a game.